To all of you who have found your way here thanks to International Talk Like a Pirate Day, Ahoy, Me Hearties! If you found my webpage mentioned in the April, 2005, edition of "Cooking Light" Magazine. 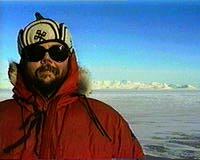 You'll find my mention of cooking Thai curry in the Antarctic here. It's approaching Midsummer at Pole. Planes come and go almost every day from McMurdo. Ice Cube construction is done, with 80 primary strings and 6 "Deep Core" strings. While you are waiting on me to have time to make updates, you can see what I was up to Fifteen years ago, and twenty-four years ago this month. Readers of the online geek comic UserFriendly might recognize me from the 2004 plot-line when the UF crew visited the South Pole. If you've been here before, you might want to look for the most recent entries in my journal. I am still recovering from fallout from my emergency rehosting in 2006, but at least my gallery and site search are working again (the recent modifications page and feedback pages are still out of order). The answer to the number one question, "how many continents are there?" is seven: Asia, Africa, North America, South America, Antarctica, Europe and Australia (in decreasing order of size). Got a question about the Seventh Continent? Have a suggestion? Found a cool Antarctic link? Or, do you just want to talk about the bottom of the world? Drop us a line! Perched on nearly two miles of solid ice, the South Pole station is home to 270 people in the summer but much less in the winter. This past year, the winter-over population was 54, somewhat smaller than the past few years (in my first winter at Pole, 2004, there were 75 winter-overs, a record 86 in 2005, then 64 in 2006), but not as small as the traditional 21-28 in the days before the new Elevated Station. The Dome, built in 1975, is getting buried too deeply in the snow to dig out every year and except for food storage, all but abandoned. The new station was brought online as parts of it were completed, with total conditional occupancy granted before the start of the 2006 winter. The new Galley went operational at the beginning of the 2003 Winter season, the new Bio-Med, Laundry, and Store were opened to the general station population at the end of the 2003-2004 Summer season, and the new Greenhouse had its first plants by mid-winter 2004. The last two pods, A4 summer housing, and B4, the gymnasium, were enclosed as the 2004-2005 summer ended. Comms moved up from the dome in the middle of the 2005-2006 Summer, then the gym was completed over the 2006 winter. The new station was under construction for several years, and all the old buildings under the dome have now been demolished. The dome itself has only a few seasons until it, too, heads North in triwalls in the back of a Herc. The old freshie shack and old workout room went in 2003; 2005 saw the demise of the old greenhouse, the old galley and the old bar; even Bio-Med is gone. The Annex was the first under the hammer in 2006, then the Comms demolition started around mid-winter. Upper Berthing was the last to go that winter, then Science in 2007. Except for food pulls, the Dome stays dark, and after they took down the old entrance last summer, isn't even connected to the rest of the station anymore. Sitting on the southern tip of Ross Island, 2,200 miles (3.500 km) due-south of New Zealand, McMurdo serves as the logistics hub for half the continent. In addition to the primary focus of the work here, science, a good part of the 1,000 summer residents (180 in the winter), process the thousands of tons of cargo brought in each year by air and by sea. Without this effort, there would be no Field Camps; there would be no station at the South Pole. Out in the field, the science's the thing. The Field Camp at Lake Hoare is one of several in the region, and is the one that I had the pleasure to work at for a few days in 1995. The Dry Valleys are so called because it doesn't snow there. The terrain prevents the right conditions from occuring that permit precipitation. Lake Hoare, for example, along with Lake Bonney and Lake Fryxell, is nestled between the high walls of the Taylor valley, tucked between tall glaciers. Moist air can't clear the terrain to bring in the snow. Protected, the frozen lake systems provide an excellent opportunity to study simple life forms surviving in amazingly harsh conditions. The appearance of the U.S.A.P logo is meant to identify the link to the National Science Foundation's Polar Programs web site, and does not constitute an endorsement by the NSF or any other agency, educational institution, or company. 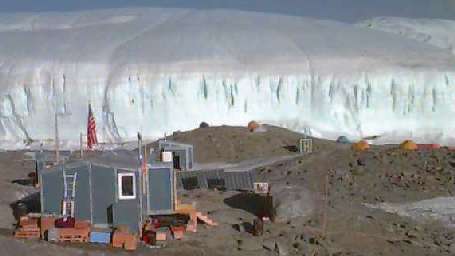 Some of the content of these pages has been verified against publications printed by the National Science Foundation and by the present and former support contractors, Raytheon Polar Services Company and Antarctic Support Associates. The opinions presented here are strictly my own. © Copyright 1995-2019, Ethan Dicks (contact me). All Rights Reserved.